Brighouse Town were 2-1 winners away to Eccleshill United in their second pre-season friendly yesterday. Mohammed Ibrahim gave them the lead on 15 minutes after a Tom Haigh effort had come back off a post. 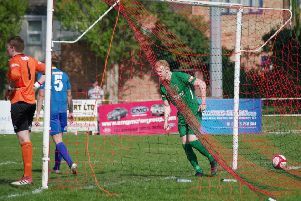 Haigh had better luck eight minutes later when he doubled the advantage with a 25-yard effort over the home ‘keeper. Eccleshill replied three minutes after half time from the penalty spot. Evo-Stik NPL side Brighouse, who had lost 7-1 at home to FC Halifax Town in their opening friendly, are in action again on Tuesday evening. However, the match against Harrogate Town will now be played away as their manager Simon Weaver is not keen for his men to play on a grass surface at this stage of pre-season.